Nooria is a housewife in Kabul. Kindness is an excellent word and brings progress in our lives. I am a mother and being kind to my children and to my friends and to my husband is essential. God bless my Dad, who was always kind to me. I lost my mother when my siblings were very young and I raised them. I raised my youngest sister and now she lives in a foreign country. I was so young I don’t remember my mother well, but as I remember, she was always ill and I was busy with my siblings because she was not able to do the chores. After my mother died, my father was very kind to us. I see only some fathers with that much compassion. He always showed piety and after he died, my husband is the best man and the best father for my children. Sometimes my children make me unhappy, but I say I forgive you this time, but you shouldn’t do it next time. Friendship has a very crucial role in our lives and without companionship, life can’t be continued. If you are not a friend with your husband and not behaving well with your children it is known that life will be dark and without happiness. Friendship brings great progress. One example of friendship is a mother’s love. If a mother acts sincerely her children will act the same way. A husband is a good friend who cooperatively lives with his family. You ask how do I represent my friendships? In order to be a good friend, we shouldn’t have rough manners. Mutual respect is significant. We shouldn’t behave in a way that hurts others. Friendship in a family is very influential and is a fundamental pillar of a family. As I mentioned, if a husband does not have good manners with his wife or with his children, the love will be destroyed between them. If there is an argument, either the husband or wife has to kindly solve it. The bottom layer of a family is love and friendship. But in our society friendship has a different explanation. In other countries or on TV shows we see there are girlfriends and boyfriends. But in our culture because we live in an Islamic country, a friend is someone from your own gender. When I was a child, I used to listen to stories from my grandfather. During the winter, we used to sit around the sandaly, which is a low table with a charcoal fire, and listen to him tell stories. We would whine to our parents to let us go to his house to hear his stories; he made us all so happy. Thank you for this knowledge, you are very wise and kind. I think you are a good Mother to your family. How blessed your life sounds. You are a wise women who has so much to offer. Thank you for your words and thank you, Fowzia for helping. Hi Nooria! 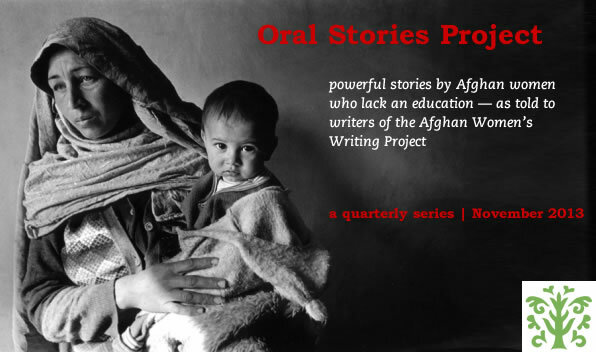 Thank you for an amazing story that sits within the other beautiful stories in The Afghan Women’s Writing Project. It amazes me that you are always grateful, and that you are kind despite the negativity that surrounds us all in this world. I am inspired by the fact that you keep love and friendship as the foundation of your family. I will definitely tell my family your story, and maybe we’ll be inspired to reshape our family.